One thing I think most of us notice as we get older is the way our sleep patterns change. From full blown insomnia to things like night sweats, unsettled sleep and restless legs…well, sleeping becomes a lot harder when you’re older! Some people suffer with bad sleep for no real cause, some are just light sleepers, and some could be caused by stress, illness and the inability to relax. It can vary from person to person, but one thing I know personally is that when I am stressed or I’m working hard, my sleep is the first thing to be affected. I take after my Mum in this sense because she is the same, and so is my Dad. One of my closest friends also suffers from severe insomnia and my partner can struggle sometimes too. It seems to be that the older we get – the more common it becomes to suffer with bad sleep. So it’s sensible to think that the best thing we could give to another, would be the gift of great sleep. Right? Now effectively we can’t wave a magic wand and create the most heavenly, deep and restful sleep. Otherwise we’d all be doing it for ourselves! 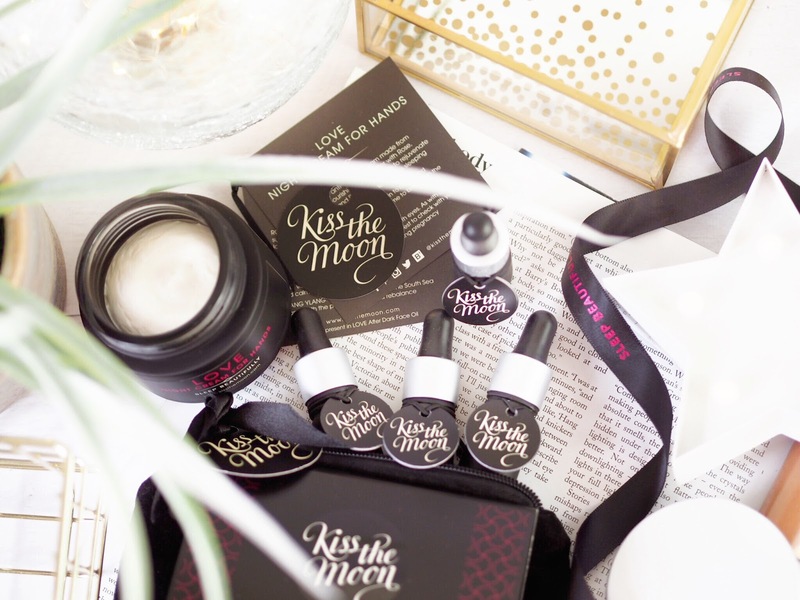 But we can do the next best thing – and gift someone we love with the Mum Gift Set from Kiss The Moon. 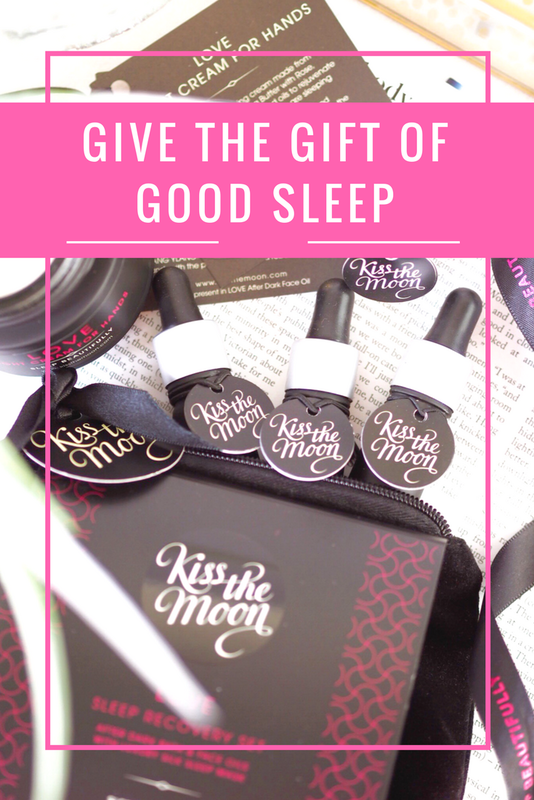 This gorgeous set contains everything you could possibly need to create the perfect sleep routine, and hopefully encourage a great night’s sleep. 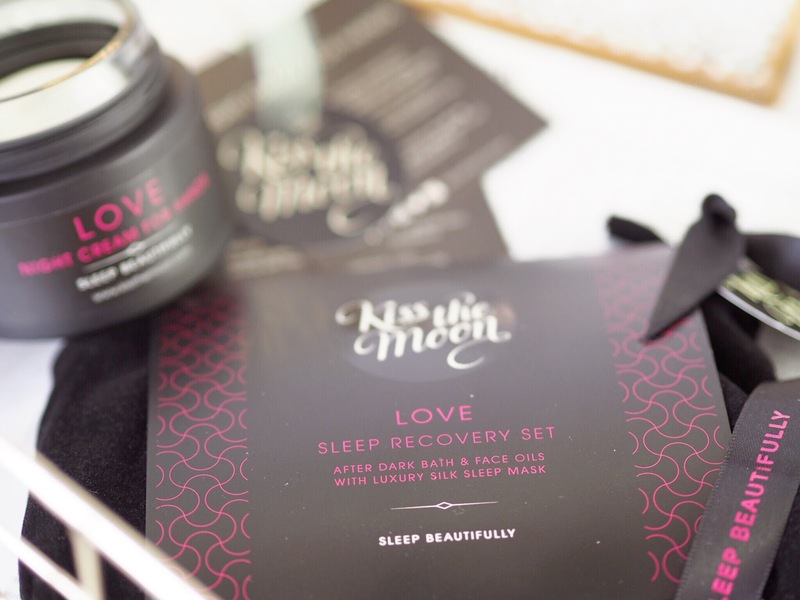 For only £45 this gorgeous set contains the Love Sleep Recovery Set and matching Night Cream for Hands – both are best sellers from the brand. The Love Sleep Recovery Set contains a selection of body and bath oils and a silk sleep mask, and comes in a matching silk bag. The oils themselves are designed to be used together in a routine before bedtime, the idea being that they deliver key ingredients to encourage deep relaxation with their sleep inducing aroma. Their deeply aromatic scents alone relax me hugely, and just being surrounded by them makes me feel like I can breathe easier, and I can almost feel myself relax as I use them. The set contains Face Oil, Bath Oil and Hand Cream so that you can run a long bath with the Bath Oil, apply the Face Oil while you soak away and the hand cream while you’re indulging in some candlelit down-time. Not only do your senses feel relaxed with the scents, but your skin feels wonderful too. Having a bath before bed (as long as it’s not too hot) is highly recommended to encourage good sleep. The unique aromatherapy blend of Ylang Ylang, Rose and White Tea Oil to name but a few, will work to build on that relaxation and create the most perfect relaxing soak for you. And the mixture of ingredients in the Face Oil works to deliver a heavy dose of nutrients while you sleep. 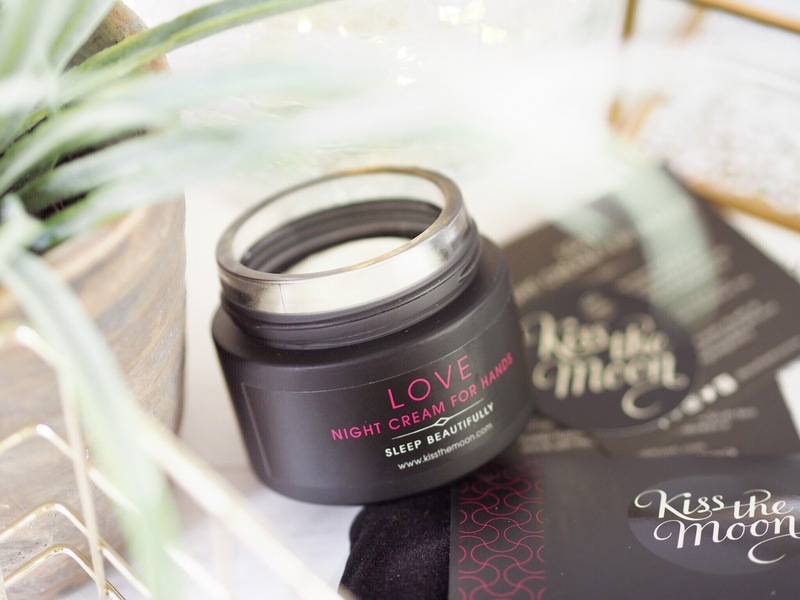 So not only will you have a good and relaxing night’s sleep, but you’ll also have great skin too! 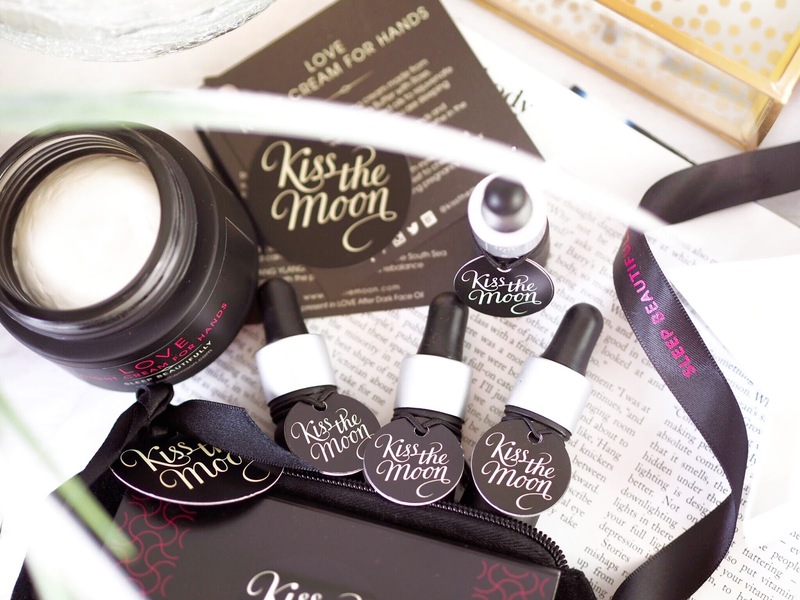 The other part of the exclusive set is the best selling Night Cream For Hands. There is no better time to treat dry and stressed skin, especially on things like our hands and feet – than overnight. Because we’re sleeping, we aren’t generally using our hands, so delivering much needed nourishment is recommended overnight. 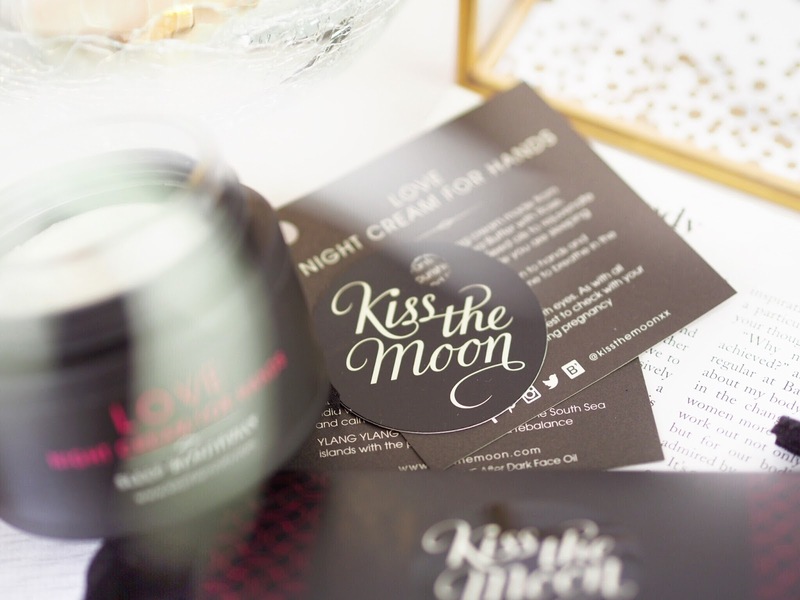 The Kiss The Moon Night Cream for Hands contains the wonder oil Frankincense, which works as a quick reviver of almost anything. With the rich shea butter, it smells absolutely divine – quote me on that. And it’s got the most silky and buttery texture that just melts into the skin. It’s not sticky or greasy and really pleasant in texture which means you’re comfortable wearing it from the get-go. With Vitamin A and Rosehip Seed Oil together, the cream aids the skin’s naturally ability to restore – making it the perfect nighttime hand cream. My Mum is forever upset with her dry hands – and I know how she feels because I suffer with it too! So a high intensity hand cream will go down a treat with her, as will the gorgeous sleep set. I can’t think of anything better than giving my Mum, or anyone else I care about, the gift that’s going to work hard to encourage something that will really benefit them – a great night’s sleep. And even if it can’t cure insomnia, this combined set will work with all it’s power to fully relax you and encourage that deep and restful sleep to arrive earlier, so you wake up feeling refreshed and revived. 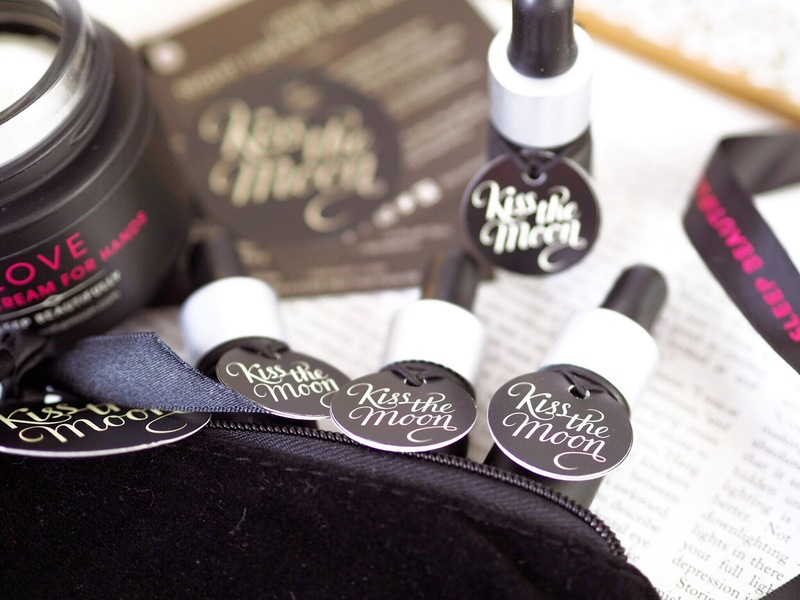 Kiss The Moon have some amazing products to help us all battle our sleep-woes. But for Mother’s Day, or even a treat for yourself, I recommend picking up their exclusive Love Mum Gift Set for an all round win. This is a sponsored post in collaboration with Kiss The Moon but as ever all opinions are entirely my own. Please refer to my Disclaimer page for more details.